The keyboard and mouse are great, we’re big fans. But for some tasks, such as seeking around in audio and video files, a rotary encoder is a more intuitive way to get the job done. [VincentMakes] liked the idea of having a knob he could turn to adjust his system volume or move forward and backwards through a stream in VLC, but he also wanted to be able to repeatedly enter keyboard commands with it; something commercial offerings apparently weren’t able to do. So he decided to build his own USB knob that not only looks fantastic, but offers the features he couldn’t find anywhere else. It’s another project which proves that DIY projects don’t have to look DIY. In fact, they can often give their commercial counterparts a run for their money. But this “Infinity USB Knob” isn’t just a pretty face, it allows the user to do some very interesting things such as quickly undo and redo changes to see how they compare. As you might imagine, the electronics for this project aren’t terribly complex. The main components are the Adafruit Trinket M0 microcontroller and the EC11 rotary encoder itself. To provide nice visual feedback he added in a NeoPixel ring, but that’s not strictly necessary if you’re trying to rig this up yourself. Though we have to say the lighting effects are a big part of what makes this build look so good. Though certainly not the only part. The aluminum enclosure, combined with the home theater style knob on the encoder, really give the finished product a professional look. 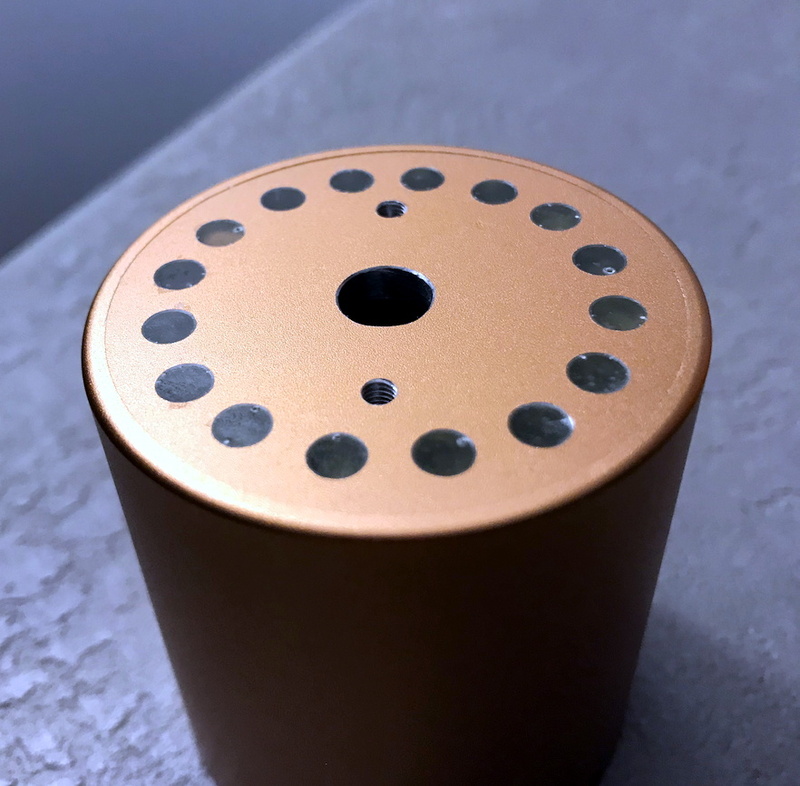 We especially like his method of drilling out the top of the case and filling in the holes with epoxy to create easy and durable LED diffusers. Something to keep in mind for your next control panel build, perhaps. [VincentMakes] has done an excellent job of documenting the hardware and software sides of this build on Hackaday.io, and gives the reader enough information that replicating this project should be pretty straightforward for anyone who’s interested. While we’ve seen several rotary encoder peripherals for the computer in the past, we have to admit this is one of the most compelling yet from a visual and usability standpoint. If this build doesn’t make you consider adding a USB knob to your arsenal, nothing will. If this was to be available for sale, I‘d buy one. Beautiful. If you want something similar search for Griffin PowerMate. I’m currently using the PowerMate on both Win7 and Win10 machines. Works fine for me. I can’t speak to availability, but there are quite a few drivers for the powermate on github. If you’re programming inclined, no need to bother with the official software. You can make it do almost anything. Out off topic, but can you fix the link to the “DIY Six Channel Arduino RC Transmitter”. Seems to be working from this end. Is it still not loading for you? Unable to watch the video at the moment but, from reading the article. It seems a lot like the commercially available “Space Mouse” by 3DConnexion. I own it and it is cross-platform and all the functions can be mapped as desired. I’m a daily Hackaday reader and all for DIY so don’t get me wrong. This seems wonderful. I’m only bringing this up because it mentions that a commercial option couldn’t be found. The Space Mouse doesn’t freely rotate but it has twist/push/pull/tilt sensitivity, it’s a very different animal. The commercial equivelant to this is the Microsoft surface dial or the logitech craft keyboard. The article mentions that he couldn’t find anything that could be mapped to do what he wants though. I use the same input device daily at work, and I haven’t found it to be very friendly about mapping the axis functions freely as desired using the vendor supplied software. For example, an axis can not produce keyboard button output (though the buttons can). The 3d Connexions has said that the device must be supported by the software you want to use with the Space Mouse and it can’t be configured to emulate functions like scroll left/right signals a mouse would produce, which is frustrating because it can produce scroll up/down like a wheel mouse. That’s a shame because it is a really intuitive Human Interface Device once you get used to having six axis input. My first thought when using one for the first time was “I really need to get this working with Descent,” but found out 3d Connexions made a point of saying it will not emulate any kind of joystick or game pad, because they make professional input devices — not toys. I recall seeing a piece of software that was able to interface with the Space Mouse and make it act like a joystick. I dont remember the name though. As for the keyboard mapping, have you tried creating macros using the 3dxWare driver, most current? I use this on macos Mojave in Photoshop CC 2019 with it mapped to specific keyboard shortcuts for use in 2d workspace as the developer only supports 3d functions natively. I do agree with you that it is not very friendly for remapping the axis controls having to set up macros for simple functions. The support team at 3DConnexion is not very friendly from my experience when looking for help getting it to function with Photoshop as that was the main reason I bought it and their site said they supported it without mention of it solely working well in a 3D workspace. +10 internet point for you… I think I’ll wait ’till I know I have enough free time to make the free trial worth while. After watching the videos it seems like what I’ve been looking for. I knew 3d connexions had an SDK, but using it really isn’t in line with what I do. I’ve been able to map macros to the buttons, but in my earlier reply I meant the axes are not freely mapable in the sense of if a program uses arrow keys for directional control you can’t make an axis emulate an arrow key press. I also wanted to mention that the space mouse says it supports a few non-CAD software packages, and though I haven’t tried to use it yet for photo editing I can imagine your frustration with it not working well (really, this thing should be great at panning and zooming). I used it in Excel to navigate in a spreadsheet, and even though Excel was listed as supported software i found it woefully lacking (read: very choppy) in how well it did – though I have to admit it was much more convenient to scroll left to right than using the mouse to grab the L/R scroll bar. It just didn’t give the quality of input you’d experience in a CAD package because it is up to the individual software designers to decide how the space mouse input is implemented. All for bling but the LED’s behind the knob don’t work unless on a vertical panel at eye level. That is the 12 o’clock position nominal. If it was squat and bigger so they show, it would be even better.